There is a 7-10 day lead time on custom chips, so plan ahead! For requested information below, if a particular part is still factory original, then just put "stock" in the box. 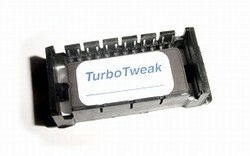 Custom computer chip v5.7 made for your Turbo Buick or Pontiac TTA. This chip has user adjustable features that allow you to do fine tuning of WOT fuel and timing if you wish (need a scantool). Choose either a street chip (pump gas), race chip (race gas), or a chip for alcohol injection. Note the '84/'85 cars with stock ECM do not have the same features. This chip is designed to work with a stock MAF, or Translator/MAF setup. Street Chip: for use with pump gas (91-94 octane), and will also work with alcohol injection, but not as aggressive as an alcohol chip. 16-18psi boost in most cases (a little lower with 91oct), WOT fuel will be set up for that boost level, around 18 degrees WOT timing. For the 84/85 hotair cars, typical boost is around 11-14psi. Cars with the 84/85 ECM will NOT have the features of the 86/87 chip. Alcohol Chip: for use with pump gas when alcohol injection is being used, timing is increased to around 21-23 degrees, boost is increased to the 20-25psi range, along with some other small tweaks to work better with the alcohol. Alcohol injection MUST be used with this chip. The calibration is made for 100% alcohol, no water mixes. Excess knock will occur if the alcohol is turned off and you go to full boost. Race chip: for use with race fuel only, NO alcohol injection, high timing around 26 degrees depending on octane and combo, more WOT fuel for high boost. I need to know what your goals are, what boost range you're going to run, and octane of the race fuel. I can make the torque converter lock at WOT if you request it. I never set the torque converter to lock at full throttle unless specifically requested. All chips are made for off-road use. -Fuel and timing curves recalibrated for improved driveability, cold starts, idle, faster spool. The intent is to maximize performance while reducing knock. -Fan is programmed to come on a 166*F unless otherwise specified. -Torque converter lockup at cruising is programmed for 45mph unless otherwise specified.